Congratulations to the team and their loyal supporters! 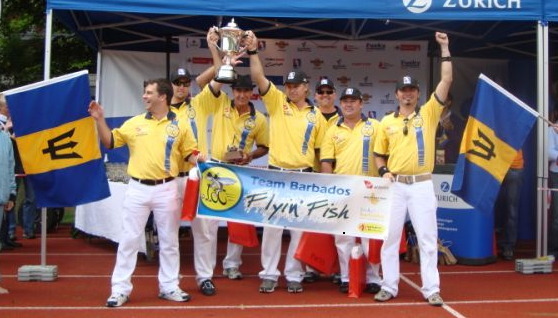 Team Barbados Flying Fish Semi Final Match #1 against the dreaded Austrians!!! After a short rain delay the match started much the same way as the other morning matches with the Fish trying to settle into their Rhythm…the first Chukka going down Scoreless. The second Chukka sees the fish playing their own game and drawing first Blood with a penalty strike by Jason Gilkes. The third chukka was a bit more physical with a few rough exchanges between the teams… However, Daniel Hatch comes away with 2 goals to none for the Austrians. The 4th Chukka would go down with plenty of fight from the Austrians with 2 shots on Goal and a Penalty shot… All three shots were blocked and the Fish go away with the Win and on to the Finals of the Woz Cup 2009. The 2nd semi final now playing between the Silicone Valley AfterShocks and the favorite German team – the Funky Move Turtles! The Silicone Valley AfterShocks defeat the Funky Turtles and go on to compete with the Bajan Flyin’ Fish for the Woz Cup 2009. Final Championship Match between the Barbados Segway Polo Team – Flyin’ Fish and the Silicone Valley AfterShocks. Chukka #2 finishes with the Fish up by one with Jason Gilkes passing to Brett DeGale to score a very nice Goal! The third Chukka starts with the Aftershocks putting some pressure on the Fish with a few attempts on goal… None get through! However, on a breakaway run Daniel Hatch takes the ball all the way down the field to the goal and skillfully passes across the Goal to Brett Callaghan to easily puts it past their goal keeper – “Uncle Vic” to go up 2 to 0! The final Chukka comes with a change to the Fish team with Mikie Hassel and Ran Rodriguez coming on to defend the slim lead. The AfterShocks mount a serious charge but fall short as the Fish hold fast and end the Chukka and the match 2 to nothing! Match Statistics for the Fish are: 22 Goals Scored, with the top score of 11 being scored by Daniel Hatch. Another stat is that only 2 goals score on the Fish for the entire Tournament!!! Go defense!!! Hassel and Rodriguez are great athletes from way back. Where are the black Bajans in that picture? Good point anon. No wonder the Barbados News Media hasn’t mentioned this achievement even though it is a good thing for Barbados. Good deeds by non-black Bajans are ignored as not worthy of mention. Good deeds such as what? Another good point, Anon. In Barbados non-blacks are not capable of doing any good deeds. Yes, of course you are right! It is so unfortunate that anyone would read this and find a negative comment to make. So what if it’s an elitist sport…so what if there are no blacks on the team…so what if you have never heard of Segway Polo. Does that mean you must put negative spin on the situation? These guys went and represented YOUR country in a recognized sporting event, all be it a new sporting event and not as widely publicized as others, and WON! They now get a chance to promote YOUR island when they host the event next year, and even if it brings in 3 more tourists to the island, that’s 3 more than YOU brought in. The reality is that there were about a dozen teams this year with about 9 people on a team. There will likely be more teams next year as the sport grows. Hotel rooms booked…restaurants to eat in…rental cars to hire…money to spend in shopping/night life. Try and show some support! You are missing the point. No Bajan outside a very, very tiny segment knows anything about Segway Polo “sports”. This is as elitist as horse polo which the owner of Barbados C.O. Williams loves so much. Therfore the Royal Barbados Segway Polo Sports Association must have very lean finances. As a commentator said that the winning team must host the following Segway Polo Championship. What I am afraid of is Royal Barbados Segway Polo Sports Association approaching Government cap in hand begging for pan cart loads of my tax dollars to host the event. I already had to suffer through the cricket world cup under the last stupid government and they wasted millions of my tax dollars on world cup cricket with nothing to show for. I do not want a repeat. Next thing we would have to construct a Segway polo stadium to house the 50,000 out of the 60 million that Adrian said would be interested but only 5 might turn up. A fine mess that would be. No Anon, for you it is all about no blacks on the team, not about financing or approaching government. Your agenda has already been revealed so don’t try to switch now. Great achievement in a new age sport by our fellow Barbadians. Anon….is evidently not an open minded person. Clearly he/she has some deeper seated issues. First of all, I know first hand that Segway Polo is not an elitist sport, or a sport only for rich people, but of course, Anon, you would not know that, would you? Have you tried to contact anyone from Segway of Barbados to see how accessible it is? Or have you ever even tried it? Um…no! Or better yet what research have you done on Segway Polo? Second of all, you want to know where the black bajans are in that picture? I’ll tell you where they are…..there are at least three black people that play Segway polo right here in Barbados. Did you know that? Um…no. The only reason they are not there is because one did not have the time to go, the other had other commitments and the third one was abroad (he actually would have made the team if he were here). Maybe Anon, you should try commenting on something that you actually know about. Lastly, if you were a bajan, you would be proud of an accomplishment and any kind of accomplishment for that matter, for Barbados, seeing this is where you work hard for your “tax dollars”! But evidently, you do not know what a real Bajan is. We are proud and we are even more proud with any and all of the accomplishments achieved by any Barbadian. Why don’t you chew on that! Well done for the good exposure for Barbados. At least one of these team members has previously actually been a great representative internationally for Barbados, in a world that takes grit and determination. His brother continues in that vein, together with other Barbadians. Well said. It is a pity that some of us Bajans cannot see beyond the colour of ones skin. A musical genius once said, we have to free our self from mental slavery. We are the ones who are in a position to choose between (a) intellectual emancipation and (b) intellectual freedom. Too many of us believe that we have to think looking though the prism of our skin’s colour. I must ad that a high % of white Bajans are just as intellectually impoverished and racially colourise their opinions. We as Bajans must look beyond the hue of one’s skin. As a small 2 x 2 country we are in a unique position set an example for the rest of the world. In our dear little country of Barbados there are a lot of examples that the world can learn from – e.g. Jew marrying Arab (at least two examples that I know of), Black marrying White (at least 50 examples that I know of), Bajan aristocracy marrying Bajan gentile (many examples I am aware of), Traditional Secondary School marrying newer Secondary School (many examples I am aware of), Pilipino marrying Bajan/ Black (I know of one example), etc. We are a great country and people who have the POTENTIAL to be world beaters, however, if we continue to be consumed by the race issue we would more or less guarantee that we will remain no more that a “has run”, a “wannabe” as we try to advance our economic status to the point that we can be considered a First World Country. This journey will need the input of ALL of our citizens – black, white, poor, rich, D, B. We are too small to be allowed the luxury of marginalizing any group of citizens of our dearly beloved country. My agenda is this, Segway “polo” is not sport or news. I really expected better Windjammer…really poor…just because a piece of equipment runs on a rechargeable battery doesnt make it environmentally friendly…..look at the thousands of joules of energy used to make and form the plastics, metals and other items used to MAKE the damn thing, and what about the reverse logistics…when the segway is done will it be sent back for recycling?…no it will end up in our landfill where it will sit for 1000s of years….but oops i guess that since it recharges overnight…(more energy) then it is environmentally friendly….brainwashed…think man…think…and to clear the air…I congratulate the team on their win….and I do NOT support the racial bias that has emerged….I am just not sold or convinced that because of this win, our tourism problems are solved! !…..come on man, the challenge to our tourism industry has alot more to do with structural issues that need to be fixed than attracting 2-3 visitors for segway sports. Business today is much more sophisticated than null minded, carrot and stick advertising pull that your publicity assertion seems to suggest…..give international travellers alot more credit….Based on your logic I am sure you have your flight booked for the IFOCE championships….I am sure you DONT! !….that is the International Federation of Competitive Eating! !…..my point exactly!! Fix the structural issues with tourism and stop the stupid notion that every time someone mentions Barbados, boat loads of tourist will come to our shores!! Had the pleasure to watch the games on sunday. Fantastic team. Congratulation guys, you deserved it. You are absolutly right Linus. You don’t need much to play this game. Take a soccer field and you have to playgrounds. No big investments. Not a sport?? …or news??? Aahhh, I see the problem now. You are a moron. My apologies for thinking you were a rational, normal thinking human being. My condolences. lol. bajeabroad….you really are an idiot. I am with yatinkiteasy on this. Open your eyes and look at the bigger picture. It’s called, “the glass is half full”. There is absolutely no supporting statement anywhere that this win for those guys will bring boat loads of tourists to our shores nor is it the holy grail of tourism. You are putting words in people’s mouths here. The positive attention that this small island and it’s people get is what it’s all about. Be it any sport, business deal or whatever. It simply peaks the curiosity and sometimes tips the scales of those making decisions where they will take their next vacation. As for Segways being environmentally “unfriendly” as you seem to think….tell me what you think about this? Would the same car you drive, or a Segway take more joules of energy to make? Which is less demanding on energy? Think man….think! How much money have you spent in the last year on gasoline, oil, water, brakes, brake fluid, parts etc. NONE OF WHICH A SEGWAY UTILIZES. IT COSTS LESS THAN 0.12c PER DAY TO CHARGE. Dont you think that is a little less demanding on energy than ooooh….let’s say your own car???? BTW..Ask your local garage where they put the used parts, oil, oil filters etc from YOUR car when they are done servicing it! OUR LANDFILL! Segway Inc has a global green initiative with it partners, affiliates and dealers that the units are to returned to their factory where the parts are recycled and/or put back into operation after re-work. Bet you did not know that! You’re just another pessimist the world needs. Thanks for balancing out the scales. FYI…the World Cup of Segway Polo in Germany was reported to have had about 300-400 visitors during the three day period. But of course your simple calculations that attracting 2-3 Segway visitors to Barbados as a result of that enlightens us all. Just so you know…to give you a hand with some more of your calculations, there were approximately 100-120 people directly involved with the game (i.e. teams, family members and people assisting). Don’t you think that if Barbados had an opportunity to host that same event, those same competitors looking to conquer a World Cup would not want to go to Barbados to get it? I mean Barbados went all the way to Germany and brought it back!! As an event organiser abroad, I have PERSONALLY organised more than 2,500 persons visiting Barbados over the last 8 years…..just so you know…….and I didn’t host any Segway events either!…..we use strategic marketing and advertising that attracts the average person in north america and not the rich and famous only! !….just thought you might want to know the numbers! !…..I maintain….you are brainwashed into thinking that this carrot and stick way of linking an image like this to more visitor arrivals actually works in 2009……not surprised…still thinking in the past like some many others!! BARBADIANS SHOULD JUST BE PROUD THAT WE WON THE CUP–IT SHOULD NOT MATTER WHAT COLOUR THE PLAYERS WERE—BLACK RED PINK OR GREEN WE WON!! !